The Once upon a time in china series are my favorites. I'll rewatch all of the movies anytime I want because I enjoyed them. When I was a kid I loved watching Once Upon a time in china 1-3 then I watched once upon a time in china and America. I became older and thought wait where is number 4 and 5. It took me some time to find them online and watch it. I was wondering why is there a new guy as Wong Fei Hung? I found out Jet Li turned down the role of Wong Fei Hung in both Once Upon A Time In China 4&5 because of money issues. I was shocked and disappointed when I found out about it. 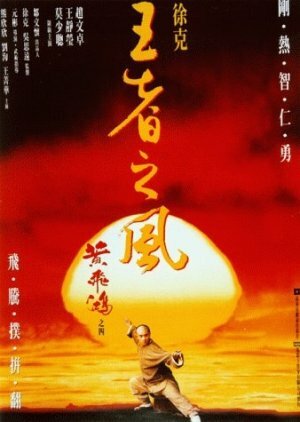 I personally like Jet Li playing the role as Wong Fei Hung because he made the character funny to watch and cool. Jet Li and Rosamund Kwan as Wong and Aunt 13 were really enjoyable to watch but sadly they weren't in this movie. This one is the first without Jet Li and also Rosamund Kwan wasn't in this movie too which meant two good actors as those characters missing. I believe the producer or some sort didn't make this movie as well so they had some actors and writers changes. They still had some good actors from the previous movie reprise their role. I enjoyed some of the fight scenes in this movie but the plot was confusing to me. Theirs always the top bad guy either one or two in this movie it had two. They weren't really much of a threat until they finally fight Wong at the end. I always love the lion dance competition where all the amazing fight scenes happen. The two main leads just didn't have any chemistry together. Vincent Zhao is good at Kung Fu but he as Wong Fei Hung wasn't that fun to watch. The music is still good because they didnt change it and I love that music still. Acting was ok I guess. Of course I would rewatch the movie no matter what. In the end movie was a little disappointment to me.